Having read part 1 of our guide you’ve already selected the perfect festival to attend this summer. You’ve also considered sleeping and eating arrangements after reading part 2 in this series. 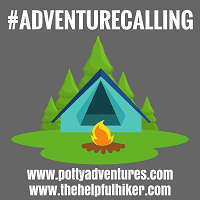 So in this, the third part of our taking kids to festivals guide, we’ll share our best tips for getting your critters moving seamlessly around the festival site no matter what weather and ground conditions are thrown at you. Let’s face it, we all hope for those gloriously long, sunny days where you and your family can lay around carelessly on warm, dry grass. Unfortunately, Britain being Britain, a grey cloud is never too far away and this will definitely impact upon how easy it is for you and your tribe to move from stage to stage. Three hours of rain at home may well not churn up the local field that you walk your pooch on but at a festival, with sometimes in excess of 100,000 people mooching around, treading all of that water into the ground, you can be sure that any persistent rain is going to result in mud. A hell of a lot of mud! Obviously your choice of festival transport for your critters will very much depend on their age and the size of festival that you are attending. However, on the whole, you have two main options: to pull or to carry. As it happens we do both as we find it to be the best option for our very young children Jesse, aged 2 and a half, and Amelie, aged 8 months. If you decide to pull you have a few options available to you. Despite the fact that we still see pushchairs at major festivals every year, we feel that they are too poor at performing in bad weather to warrant their packing size and weight. 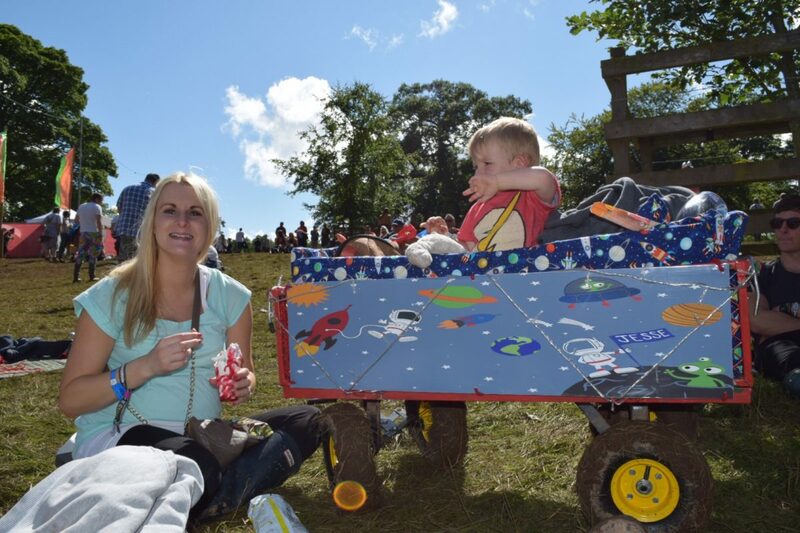 Every time we have had mud at a festival we have seen a pushchair or buggy stuck in it. Simple. Therefore people with these end up far removed from the festivals main attractions desperately trying to keep to any sign of solid ground. Festival wagons are now a common site at virtually all of the major festivals that pride themselves on being family friendly. However, these themselves come in a range of guises and styles each with their own specific advantages and disadvantages. One of the first considerations to make when choosing a wagon is how will you transport it to the festival itself. Large wagons take up a heck of a lot of space so unless you have a large family car or van available to you a foldable trolley may well be your best option. Foldable trolleys, as their name suggests, will pack down nicely making them fairly easy to fit in among everything else that you plan to take when you are playing your first game of car packing Tetris on the morning of departure. They also have decent ground clearance meaning they are ok being pulled over uneven ground and fields. However, their small wheels mean they can become very difficult to manoeuvre in wet and muddy conditions. Furthermore, as the frame is designed to fold it won’t be able to carry the same weight that more solid designs can, meaning they may not be suitable for carrying more than one child or older children (and meaning that you may have to make more trips back to the car as you probably won’t get all of your gear in it first, or even second time round). They also do not come with a canopy meaning you’ll have to concoct your own should you wish to make it a waterproof haven for your critter. Finally, these tend to be the smallest of all of the available designs so using them as a transportable sleep chamber may also be an issue for kids after a certain age. Ready made festival wagons can also be bought through many online outlets. Obviously, as with anything, read the reviews that accompany their description, but on the whole this type of wagon tends to be fairly similar regardless of the brand. Most of these come with much larger wheels far more suitable to the great outdoors and prolonged use and most also come with a showerproof canopy. Note: these are not waterproof so if you get any sort of rain that sets in a for a few hours or even a whole day, it won’t keep your critter entirely dry. Obviously there are things that you can do to combat this that doesn’t mean spending all day in the tent. For instance, I have seen wagons with PVC shower curtains draped over the canopy structure to add an extra layer of protection, but these then just become something else to pack and carry around with you. That said, the structure and frame of these wagons is far stronger than the foldable versions and their solid sides and larger internal dimensions make them much easier to fit out with a range of cushions and blankets to keep your critter cozy into the evening. Your other option for transporting your critters around a music festival is to carry them. Again, in dry weather your options are so much more open and we still take our smaller carrier/sling for the baby for just these occasions. They are so small and light that packing them as an extra is no trouble at all and they certainly give you that close baby bonding feel that we all crave. However, you have to be practical. Even in dry weather you could be outdoors for all of the daylight hours and most slings offer little in the way of sun protection so hats and clothing with an SPF rating should be considered. They also offer nothing in the way of rain or wind protection so you should have an alternative in mind for poor weather. As ever, if you have any comments or specific questions about this guide or any of the others in this series please do get in touch with us. Next time we’ll be looking at the safety and welfare of critters at festivals. It’s not to be missed. My boys would love a wagon! Ha! I’d love to do a festival with the kids, not this year unfortunately, but will keep your tips in mind if we ever get around to one! I wonder if they do those trollies for adults, then my family could pull me around. I miss not being able to go to festivals because of my wheelchair and scooter not being able to cope. That must be a real issue. I tell you what there must be a gap in the market for such a product to maybe hire out at major events. Thank you for reading and hosting. Sounds great! Have a lovely time at Bestival it’s a really good festival. Ah thank you. Our eldest who is not yet 3 loves going to festivals and camping, our 9 month old baby has camped but this is her first festival season. Fab post. The one you made is amazing! Thanks for linking up to the #BinkyLinky Sorry the comment is late – we’ve just returned from holiday! I’m loving this series! The pull along wagons are a great idea for when the little ones legs are tired. They do unfortunately. Ut as soon as the mud strikes they soon regret it. Thanks for reading and hosting.